2016 years in the United States next month, LG Electronics is the world's largest consumer electronics show held in Las Vegas 'CES 2016' 'plus tons (HBS-910)' unveils. This product is specialist sound equipment, Harman Kardon, and a premium Bluetooth headset offers superior sound quality through technology partnerships' ton plus series (HBS-910, HBS-900). 2016 years' Tone Plus is an improved automatic line applies to existing products against the cold juleotgo weight sleek design modules were implemented. You can feel comfortable to wear even for long time use, plus tons. LG Electronics has implemented a more mature Premium Sound applying a proprietary "Quad Advanced Layer (Advanced Quad Layer) diaphragm 'to this new product. Yirwojin diaphragm with 4 layers is difficult to implement a high clear and rich low expression of a single-layer diaphragm at the same time. 2016 years 'tone plus a tapjaedwae a "dual microphones' sensitivity, the call was significantly improved. This product has two microphones were installed in the best position close to the mouth to be accurately capture the voice. User quiet environments such as offices or libraries may call clarity even in noisy environments, such as ambient as well as subway commute. This product has been added to the headset app features (LG Tone & Talk) allows you to record a voice smartphones only button operation. 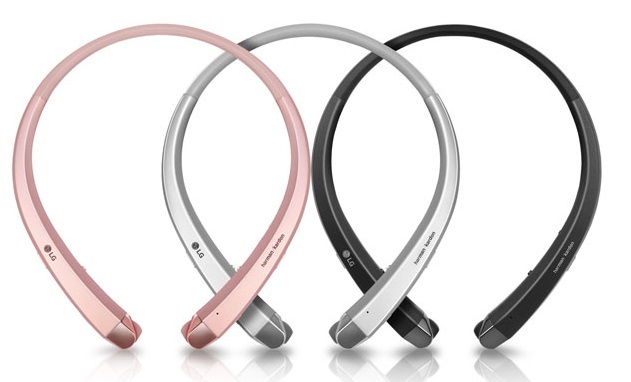 In addition, the user activates the alarm in the phone associated with the products "Find Phone" button operations to take advantage of the features of the app, you can easily find a phone headset.LG Electronics will launch next February Sequential this product to the United States starting in Korea, Europe, Latin America, Asia and other global markets.